This is the second case the Animal Legal Defense Fund has won against the Cricket Hollow Zoo under the Endangered Species Act. As a result of the first case, which went to trial last October, four endangered tigers and three endangered lemurs were transferred to new homes this summer. Upon African lions being added Endangered Species Act protections, the Animal Legal Defense Fund sued Cricket Hollow Zoo on the same grounds. 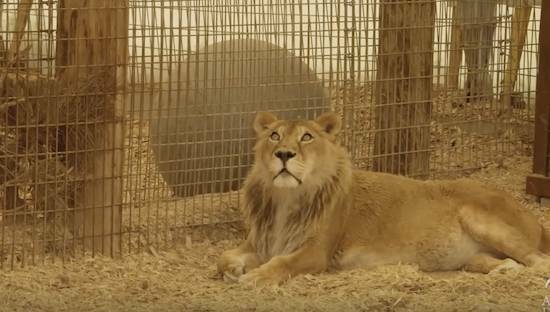 Two imperiled African lionesses are now safely in the care of The Wild Animal Sanctuary in Colorado, after the Animal Legal Defense Fund reached a settlement with Pam and Tom Sellner, owners of Manchester, Iowa’s Cricket Hollow Zoo. On Monday, Aug.1, 2016, The Wild Animal Sanctuary took custody of the two lions with veterinary support from the Blank Park Zoo in Des Moines, Iowa. Upon emergency veterinary assessment, it is clear that Jonwah is emaciated with her bones and vertebrae visible. Due to extreme hunger she had been eating the straw provided to her as bedding by the Cricket Hollow Zoo. Because she was unable to digest the straw, it created a blockage in her intestines. She was so weak, she was unable to pass the blockage on her own and was sedated to receive an enema to remove the block. Jonwah is expected to recover now that she is receiving proper nutrition. Njjarra, who is also severely underweight, is now receiving proper nutrition and will see an ophthalmologist for her painful cataracts. The lions will recover in The Wild Animal Sanctuary’s Bolivian Lion House—an indoor enclosure with significant space, opportunities for enrichment and the company of other lions, divided by fencing. Health permitting, Njjarra and Jonwah will transition next to an enclosure with indoor and outdoor access, before finally being transitioned into a compatible, existing lion pride in one of the sanctuary’s 20-acre habitats. There they will live out their days in social groups with access to the quality veterinary care that is so necessary for their health and well-being. The Lionesses, Jonwah and Njjarra, are 16 years old and 18 years old, respectively. 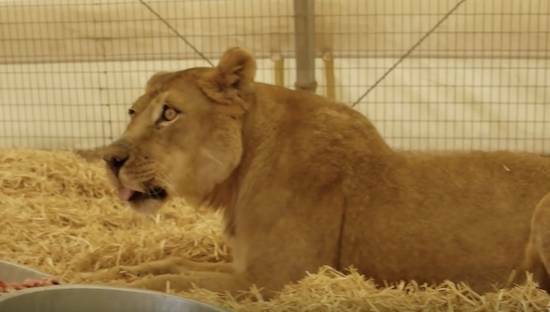 Visitors to Cricket Hollow Zoo in June and July had reported both lionesses in distress, the evidence of which the Animal Legal Defense Fund presented to an Iowa judge on July 21, 2016. The judge agreed with the Animal Legal Defense Fund’s grave concerns about the lionesses’ condition and ordered the Sellners to permit a qualified veterinarian to examine them. The parties settled soon after the examination.